A vehicle accident broke a utility pole off near the ground early Wednesday afternoon causing traffic to be backed up in the eastbound lanes of 52 in Portsmouth near New Boston. Portsmouth Police and fire were on the scene as well as American Electric Power to do the repairs. SCEMA has sent out an alert for a downed power line in Portsmouth. Traffic disruptions can be anticipated heading eastbound on US 52 into New Boston until early evening. A traffic accident has downed a main transmission line for American Electric Power that will require some time for repair and replacement to the pole and line. Portsmouth Police Chief Robert Ware is advising motorists to find an alternative route east by either taking the Kentucky side, Scherers Hollow Road into New Boston or by going US 23 to the Portsmouth Bypass SR 823 and to US 52. One lane traffic will be in effect for the block of Walnut Street (US 52 East) until the pole is replaced and the newtransmission line is installed. 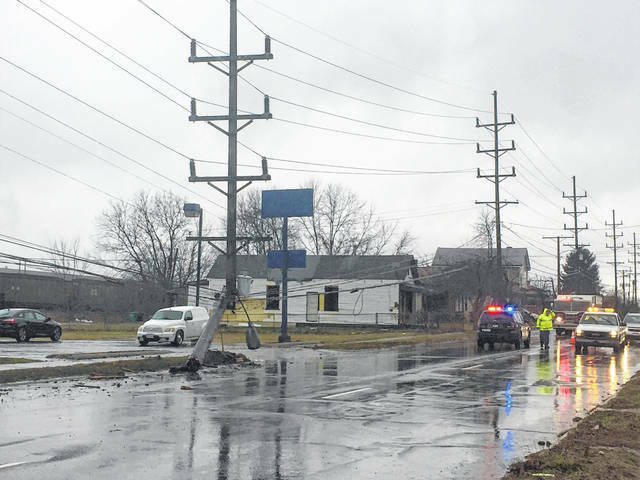 https://www.portsmouth-dailytimes.com/wp-content/uploads/sites/28/2019/02/web1_POLE.jpgA vehicle accident broke a utility pole off near the ground early Wednesday afternoon causing traffic to be backed up in the eastbound lanes of 52 in Portsmouth near New Boston. Portsmouth Police and fire were on the scene as well as American Electric Power to do the repairs.